Description Construct blocky layered models from well data using simple kriging. The Low Frequency Model (Simple Kriging) process constructs blocky layered models from well data and supporting information. At each location, each window model layer are populated with a single value. The values are determined based on cokriging the values between each well and the layer and the supplied drift terms. Scroll down and double-click LF Model (Simple Kriging). 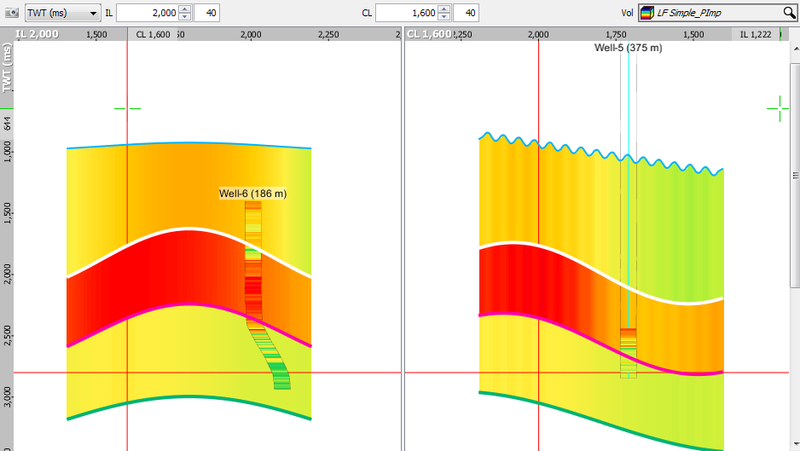 At Water bottom, select to use a Constant or a Horizon, to define the water bottom for the trend. If you choose to use a horizon, you can optionally input a constant value to offset the horizon. This will only appear if you have selected a depth trend based on water bottom. At Wavelet, select the wavelet to be used in the process (see Creating a Wavelet). Type the angle of incidence for the low frequency (simple kriging) modeling at Angle of incidence (deg). The wavelet and angle of incidence are used to generate the LF Model (simple kriging) synthetics volume. Inline extent — Type the range of inline extent and sample interval for the low-frequency (simple kriging) model. Crossline extent — Type the range of crossline extent and sample interval for the low-frequency (simple kriging) model. TWT/TVDSS — Type the time/depth extent and sample interval for the low-frequency (simple kriging) model. 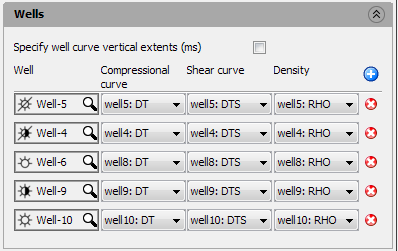 Specify well curve vertical extents (ms) — Select this check box to define the well curve vertical extents for each well that you use in the modeling. Well — Click the Add icon to to add the wells used in the modeling and define the compressional, shear and density curves for each well. Krige horizons - select a windowing model — Select the windowing model that you want to use in the modeling (see Creating a Windowing Model). Horizontal kriging range (m) — Type the horizontal kriging distance for the modeling. Vertical kriging range (ms) — Type the vertical kriging distance for the modeling. Collocated volumes — Click the Add icon to add collocated variables in the modeling and type the correlation coefficient for the variables at Correlation coefficient for collocated variables (this field will only be available once you have added a collocated variable). Include a constant trend? — Select this check box to include a constant trend in the modeling. Depth below water bottom — A water bottom must be supplied for this trend. The option to define the water bottom will be available above. Water bottom depth — A water bottom must be supplied for this trend. The option to define the water bottom will be available above. Velocity volume — For any depth-based trend, select the corresponding velocity volume used to calculate the trend. Velocity type — Select the type of velocity used to calculate the trend. Trend volumes — Click the Add icon to add trend volumes in the modeling. 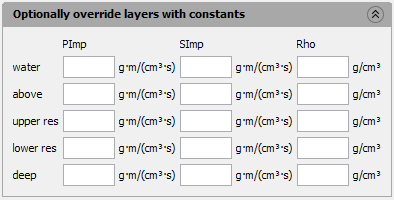 Type constant values for the compressional, shear and density curves for each layer in your windowing model. This is optional if you want to override the layers using the constant values in the low-frequency (simple kriging) models. Note: The number of windows is based on the windowing model you are using in the process. 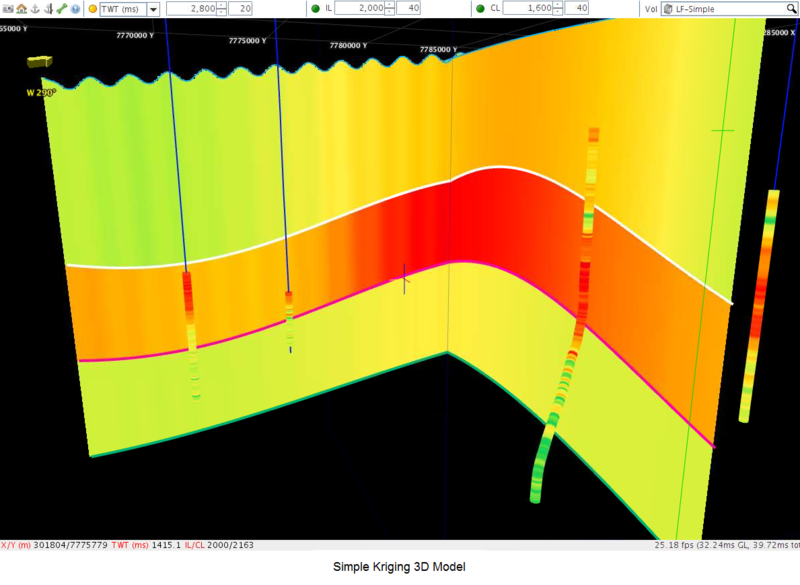 As a result of this process, new LF model simple kriging volumes are available in the Volume tab. 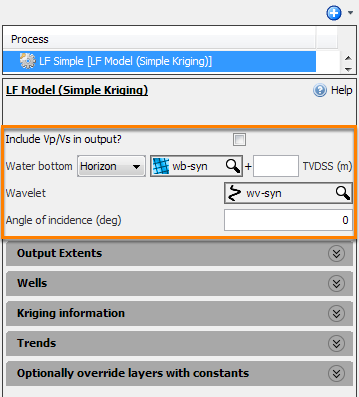 If you have selected to generate the Vp/Vs volume as an output in the process, you will also see the LF model simple kriging VpVs volume in the Volume tab.